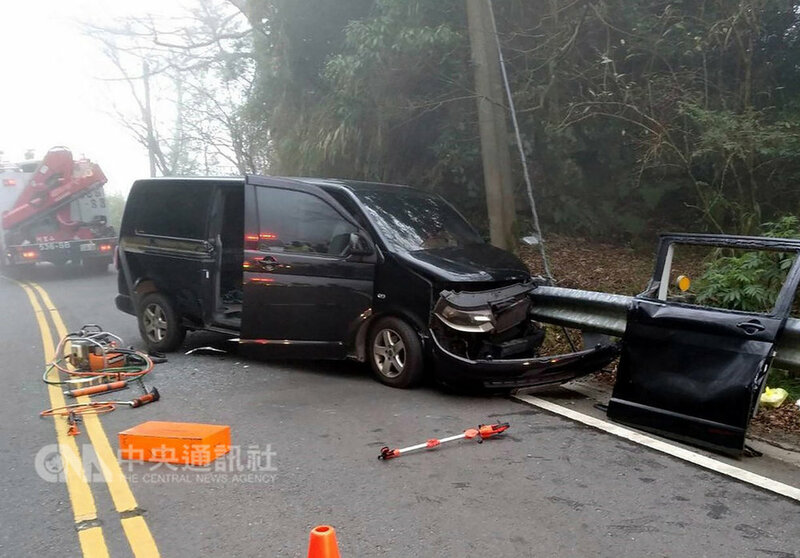 Six tourists from China, including an elderly man who suffered serious spinal injuries were taken to hospital yesterday after their van crashed into a railing on the Alishan Highway that connects Chiayi City with the Alishan National Scenic Area. The tourists were part of a family of eight that were in the van when it crashed into the railing at around the 95.2-kilometer mark, CNA reports. Chiayi County Fire Bureau third corps Alishan branch head Huang Chien-che said the 70-year-old passenger suffered a serious spinal injury that left him paralyzed, while the other five had injuries such as bruising and lacerations. The family of eight had just ended a trip to the central city of Taichung and were embarking on their journey to Alishan when the crash occurred, Huang said, adding that the suspected cause of the accident was thick fog that affected the driver's vision.